Real Madrid outclassed Ajax tonight in the Santiago Bernabéu, after beating the Dutch side by 3-0. Cristiano Ronaldo added another goal to his tally, but it was Kaká who delighted the crowd with a nostalgic performance. Real Madrid confirmed expectations as they defeated Ajax tonight by 3-0, in the Santiago Bernabéu. Cristiano Ronaldo scored his first goal of the season in the UEFA Champions League and his 9th when accounting all competitions. However, the MVP of the night has to be granted to Kaká, who had one of those nostalgic performances, that make people remember the times when the Brazilian got awarded the FIFA World Player of the Year trophy (2007). Helped by a great performance from Kaká and Cristiano Ronaldo, Real Madrid didn't face many difficulties to beat Ajax tonight. The Brazilian scored one goal and assisted for another, while Ronaldo managed to score his first goal of this UEFA Champions League edition. Real Madrid now counts with 2 wins out of 2 matches and is on the right tracks to get an early ticket for the last 16 stage. Real Madrid started the game with typical 4-2-3-1, where Xabi Alonso and Khedira were the ones responsible for conducting and dictating the team's tempo. Mesut Ozil had orders to play by the sideline, while Kaká had more of a free role, in order to allow the Brazilian to combine well with his teammates wherever he could find spaces. However, Ajax strategy somehow blocked Real Madrid intents in the early periods of the game, as the Dutch side managed to keep their net far from danger and was still able to threat Casillas, with fast counter attacks by the sidelines. It's not by chance that many regard Real Madrid as the best team in the World when playing in counter-attack. It was around the 25th minute that the Merengues showed how to combine and finish a beautiful and fast play, with Kaká, Ozil, Cristiano Ronaldo and Benzema being the main actors of this first masterpiece. Cristiano Ronaldo scored the first goal of the night, as well as the first of his tally, if accounting only for this year's UEFA Champions League edition. Ajax started to give more spaces in forbidden areas and Real Madrid would still manage to score a second goal before the half-time, in a good combination between Cristiano Ronaldo and Kaká. The Brazilian found a good spot, tried his left-foot shot and made the 2-0 just before the break. The second half would start with Real Madrid trying to slow down things, in order to control the outcome of this match. Even though the game was being played more slowly, the Merengues would add another to their lead, after a good combination between Arbeloa and Kaká, allowing the Brazilian to assist Benzema for an easy tap-in. The game wouldn't suffer any major changes from that point on, but as a negative note, Benzema was forced to leave the game after picking up an injury and Cristiano Ronaldo was also seen in pain close to the end. 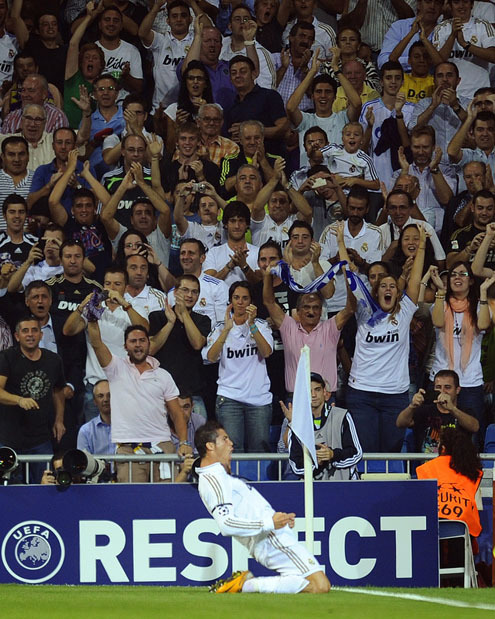 Real Madrid next game is against Espanyol, for the Spanish League, next Sunday (02/10/2011). 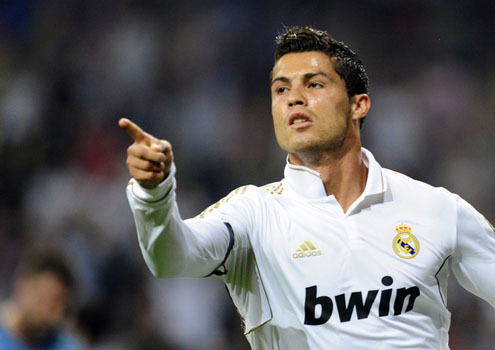 You can watch Juventus live stream, Espanyol vs Real Madrid live stream, inside our Live Games Streams section. Cristiano Ronaldo should be a starter. The countdown clock timer, displaying the time left for the next Ronaldo game, is shown on the top right corner of all pages. You may still watch BATE Barisov vs Barcelona online streaming this Wednesday, as well as Manchester United vs Norwich live stream next Saturday, in our "Live" section.